Baby Jogger City Mini Zip is a lightweight stroller that is some where in between the full size and an umbrella stroller. While having a lot of great features like large canopy, roomy seat, deep recline, and adjustable leg rest it has a very compact three-dimensional fold where it folds not only vertically, but also horizontally. This small package is 50% more compact than on standard umbrella strollers and is 1/8 the volume of the open stroller. Great for traveling! And since it weighs only 17 lbs, it’s super easy to load in and out of the car. Although it says that this is a one-hand fold, I did need both hands to push it together to activate the auto lock. Keep in mind, that despite it’s name ‘Baby Jogger’ this is NOT a jogging stroller. I know many parents get confused by the name of the brand. This buggy is designed for running errands, quick trips to the store and traveling. While it could be your ONLY stroller because it does have a travel system option, I would recommend using it as a second lightweight stroller instead of an umbrella model because of the wheel size. The small wheels don’t provide that much suspension so it will be a bumpy ride for your newborn if you decide to go for a long walk at the park. Now, if you just go to the mall where the surface is perfectly even, it will be fine. The roomy seat has a deep recline so you could put a newborn into the seat or use it with a travel system. The seat can accommodate a child up to 55 lbs. If you want a lightweight stroller with travel system option, but larger wheels, I would get City Mini or Britax B-Agile. I gave it 3.5 out of 5 stars because I think this is a great alternative to an umbrella stroller. I would like to see a taller seat back, since 16″ is a little on a shorter side. This is probably due to the 3D fold. I would also like to see a peekaboo window and adjustable handle bar. While I like the concept of Zip, it got such a low rating from me because of the poor quality. Many parents reported having troubles with the wheels, brakes and front wheel locks after using it only a few times. Everything worked fine for me, but I used it only for a week. It retails for $199 on Amazon and comes with a cup holder. -Huge canopy. It has a large three-panel UV 50+ canopy that will provide your child with full sun protection. This is much larger than found on most umbrella strollers. Unfortunately, there is no peekaboo window. -Handle bars. The non-adjustable handle bar is located at 38″ from the ground. This is not the tallest handle bar. I would say on average most non-adjustable handle bars located at 40″. If you are much taller, test it first. It’s covered with rubber and has a large buckle in the middle because of the compact 3D fold. I found that this large buckle really gets in the way if you want to steer it with one hand. -Roomy seat. The seat is 14″ wide with 16″ seat back and a measurement of 26″ from the back of the seat to the top of the canopy. 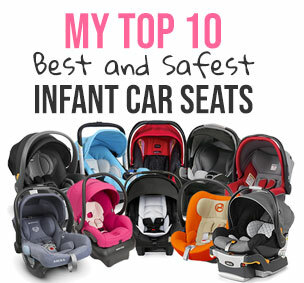 The seat back is very short comparing to most strollers that on average have 20″ seat back. On the other hand the canopy height of 26″ is a little taller than average which is around 22″ – 24″. It has a deep one-hand recline operated by a strap system which is not my favorite because you need both hands to bring the seat back up. I would like to see a one-hand lever recline instead. On the bright side, the recline goes to almost flat position suitable for a newborn. The seat can accommodate a child from birth and up to 55 lbs. -Mesh window. Just like on a City Mini model, there is a mesh window in the back with a Velcro cover that you can see once your recline the seat. This is a great way to improve air circulation on a hot summer day. The one problem I have with it is that because the seat back is only 16″ high that mesh will get in the way of a taller toddler. So your older kids might not be able to nap. -5 point harness. It has a 5 point adjustable padded harness with center release buckle that is not very hard to do. -Adjustable leg rest. The rest leg is adjustable with two positions: up and down. -Large pocket. There is a large mesh storage pocket on the back of the seat that you can use to store small essentials like cell phone or keys. -Medium size basket. Because of the compact fold the basket is on the smaller side. You should be able to fit a medium size diaper bag in it. The crossbar also gets in the way when you try to access it. Even though it’s not my favorite basket, it’s still better than on most umbrella models. The sides of the basket are made out of elastic mesh, so you can get in from the side if the seat is fully reclined. -Wheels. It rolls on four EVA wheels with 5.5″ wheels in the front and 7″ wheels in the back. The front wheels are swivel, but can be locked straight for rougher terrain. These wheels are designed for flat surfaces and don’t do well off road. -Front wheel suspension. There is a front wheel suspension that absorbs some of the bumps. -Parking brake. It has linked parking brakes located on the rear wheels. -One-hand fold. The fold is easy, but I had to use both hands. First you need to push a button on the handle bar to unlock it. Next, pull on the handle bar located in the middle of the seat and push the stroller together until you hear a click of the auto lock. I had to use both hands to push it together and engage the auto lock. I would not be able to do it with a baby in my hands. So, I think that it’s a little misleading. BTW, you can fold it with the bumper bar attached. The 3D fold is 50% more compact than on standard full size umbrella stroller. The folded dimensions are 10.2″H x 12.5″W x 29.5″L. There is also a standing fold. -Cup holder. INCLUDED! I would not put anything, but a water bottle or a sippy cup in it because it always tips to the side spilling my coffee. Who wants to spill the coffee on a baby! I would actually suggest getting a parent organizer with a cup holder. That way, you will have more places to store your stuff and will have a safe place for your coffee. -Bumper bar option. Although there is a bumper bar that you can purchase separately for Zip model, it’s not listed on Baby Jogger site as available accessory. How odd is that? Did they make a bumper bar and forgot to mention it? Anyways, it retails for around $29 on Amazon. -Travel bag option. I also wanted to tell you about the storage bag. I really like that the stroller fits into that small bag fully with wheels attached and the bag has shoulder straps so you can carry it like a backpack. Great for traveling! You can get it for around $59 on Amazon. -Hard to access basket. Because of the compact fold the basket is on the smaller side. Also the cross bar gets in the way when you trying to access the basket. It’s still much better than most umbrella strollers. -No peekaboo window. The canopy is large, but does not have a peekaboo window. -Short seat back. The seat back is only 16″ where the average is at around 20″. Since there is mesh material at the top when you recline the seat, your taller toddler might not have enough of head room to take a nap. Baby Jogger gives has a lifetime warranty on the frame of the stroller and 1 year on small parts and fabric. Here is more information on the warranty. It comes in black, red and teal and has black frame. My favorite place to buy strollers and a lot of other baby items is Amazon. It usually has the lowest prices, free shipping, free returns and no sales tax. How great is that? You can get City Mini Zip in one of the three beautiful colors for around $199 on Amazon (free shipping/free returns and no sales tax). Thanks so much for this review. I love this stroller but my older child is 3 and pretty tall. She still sleeps in the stroller if we are out all day. How much of an issue is the short seat back and mesh? Will it be impossible for her to lie down? Not a good stroller. Sides are not padded. Baby can get a bruise if the lean to the side. The safety clip that keeps the stroller together when folded is a hazard as when seat is reclined baby’s head/face can easily get caught as the fabric is so thin. NO peek a boo for parents. Not worth it if you have taller child. So many warranty issues that one baby shop discontinued the city mini zip. the hood sits really high so if you’re on the short side you’re unable to see anything if you’re looking down (won’t be able to see whats in front of you that well ). It is a heavy stroller and on the wide side when you fold. Good idea but it need to be updated. How long have you been using this pram? I bought mine 2 months ago and found the seat too slippery. My daughter kept on sliding down. She feels uncomfortable sitting on it and preferred our bigger pram (Baby Jogger City Select). Just wondering if someone else have experienced this. This is a good stroller… my daughter is now 16 months old (and she’s been using it since 9 months)… she is 50 percentile in weight and height… sits higher than average stroller… it’s spacious… my friend’s 6 year old uses it sometime when he gets tired and he’s with us…. the back lays down flat… it folds in half with one hand..
Any chance the glider board works with this mode?